New Coleraine First XV coach Benjy Van Der Byl. Coleraine Rugby Club has appointed a new coach as they prepare for next season. The Club has named Benjy Van Der Byl as head coach for rugby. He has already taken over the reins and is working hard to get things in place for the incoming season. Benjy is well-known at the club having first come to Coleraine from his native South Africa in 2002 as part of the Natal Sharks development programme. 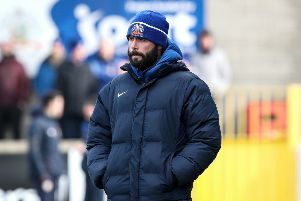 He played successfully at the club for six years, making many lasting friendships there, and left to take on a role as backs coach for Ballymoney. Since that time Benjy has been developing his coaching skills with Ulster Ladies, Ballymoney and most recently at Dalriada School. In the past few seasons the school has had great success in the very competitive arena of the Schools’ Cup and Benjy is very proud of their success. Speaking last week Benjy explained some of his hopes and plans for his new role. He said: “As a Club Coleraine has been through a lot in the past few years and we are firmly back in Division 1 of the Championships. I want to build on that. “I want to play a brand of rugby that players and spectators will enjoy. I want the players to enjoy training and playing and I will be working hard to achieve that. “Fitness is key to success in rugby and I will be introducing different training ideas to make it fun but effective. If the guys aren’t fit they won’t get the same enjoyment from the game, so we will work on that. “The Club used to field five teams but we will be concentrating on getting three competitive sides every week. We want to see families, friends and all our club members getting involved and supporting the teams. “I will be working hard and I invite everyone to join me. We want to see players, new and old, back on the field, enjoying their sport and enjoying their association with the Club. Plans are being made to start pre-season training early in July. Watch out for further details in the press, the Coleraine Rugby website and social media channels.